Its the fall of 2012 and I’ve only been back from my epic India trip (where I taught English with an awesome crew to a few schools in Punjab) for a few weeks. I get an alert from YVR Deals about a fare sale to a few Asian countries for $600 RT from Seattle. Long story short, we miss the deal to Bangkok but my friend Mandeep and I snag a flight to Manila, Philippines for $850 all in flying with All Nippon Airways, one of the nicer airlines out there. Impromptu trip! This will be our first backpacking trip since we both graduated and have not found full time work. The goal of this trip is to stay within budget! The month or so before our trip is spent researching destinations and buying all the supplies we need. Much of my backpacking know how came from researching for this trip and it just pumped me up as the weeks went by. Its a rainy morning on November 1st, 2012 as my parents drive us down to the airport to catch our 11am flight. 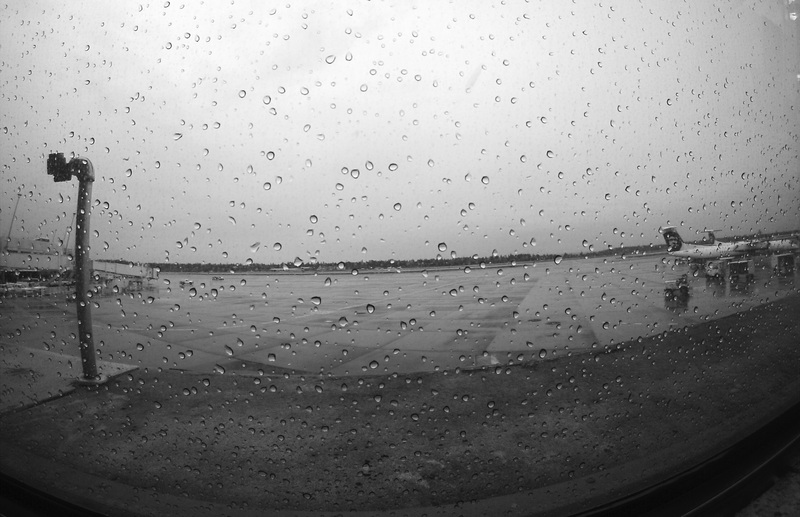 Typical Pacific Northwest weather: grey, rainy, wet and cold. We board onto one of their new Boeing 787’s ( yes the ones with the battery issues) and we are just amazed. The amenities on the plane are sleek, modern and clean. Windows and faucets are automated, toilets are self flushing and lavatories are not claustraphobic. They even have room for a full length mirror! The staff are very friendly and we knocked back a few beers before we pass out. In flight meal aboard ANA. Seriously did someone run a comb through my soba noodles? Fiji water?! Haagan Daz?!?! 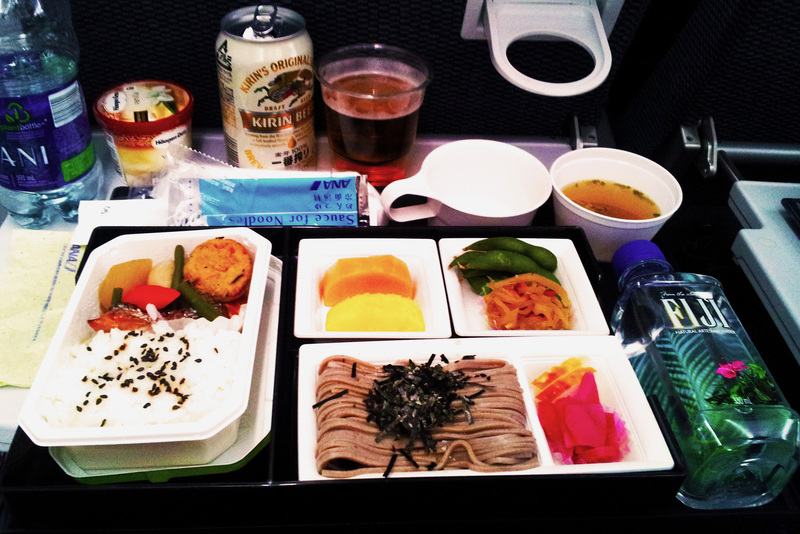 I wasn’t flying first class but the food sure made me feel like I was! 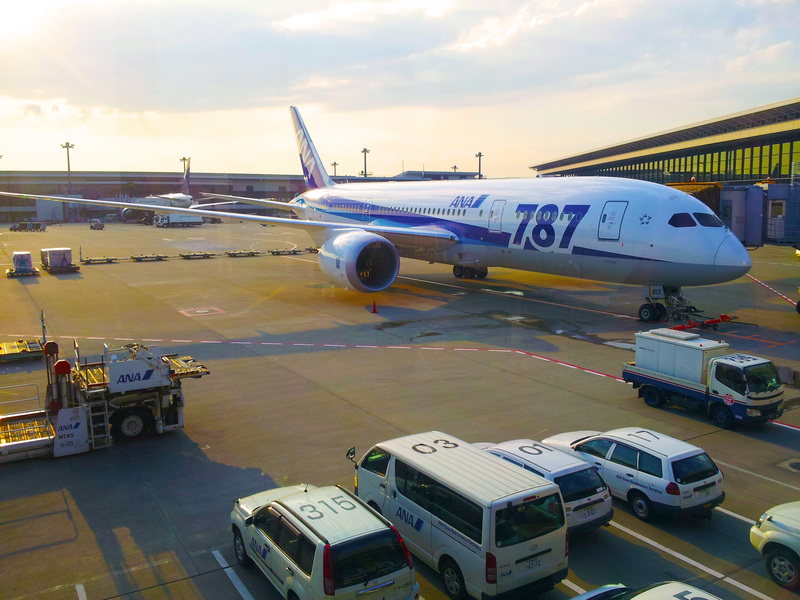 The Boeing 787. I’d ride it again. No batteries spontaneously lit on fire during our ride. Taken in Narita Airport in Tokyo, Japan. Fast forward 20 hours and we arrive at our very first hostel in Manila close to midnight. We drop off our bags and make our way to a street restaurant across the street. Fried whole tilapia and fried pork leg with soy. Delicious first taste of the Philippines. Our initial plan is to catch a morning bus to the north part of the island called Banaue, arriving in the early evening. Unfortunately, at around 2am, we find out that in order to do that, we have to catch a 4am bus. We essentially nap for an hour and leave to catch our bus. This was by far the most expensive hostel I’ve stayed at to date considering how much time we were actually there! Bright and early in the morning to catch our bus to Bagabag. Seriously though it was so early it was still technically night. I think we were operating on sugar and excitement but not much else. The bus ride is a brutal 9 hours long. We make a few stops where we pick up snacks like sweet cheese fritters and fried pork rinds (chicharones). But oh no, we’re not there yet. We arrive at the Bagabag junction (literally a busier intersection that breaks up the partially paved roads) and find our way to the first of 2 Jeepneys. Jeepneys are the Philippines’ answer to public transit. Its essentially a modified pickup truck that holds people (or whatever else) and runs specific routes. They’ll stop wherever you want on the route and you pay according to how long you’ve been riding. We ride into the town of Sagada and from there take our final jeepney up the mountain to Banaue. 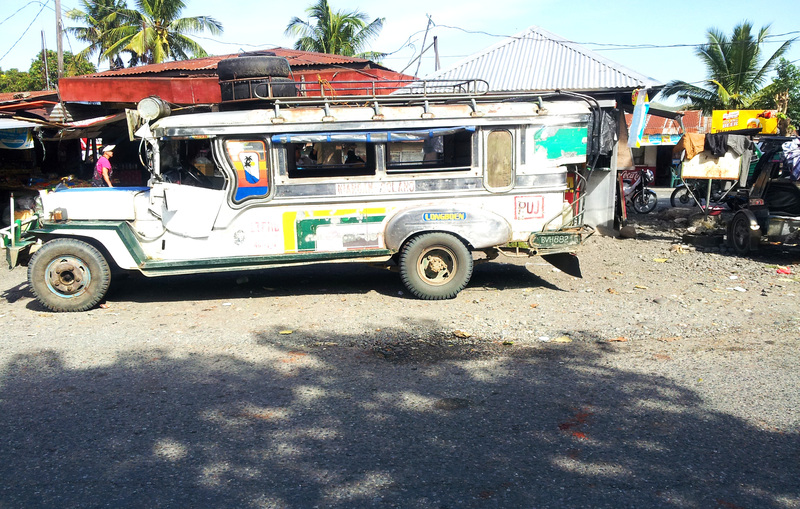 This Jeepney has seen better days. Take a few of these and ride along with the locals. Its cheap and effective! Arriving at 5pm, we’re exhausted having transited so far and so shortly after a flight. We arrive at Uyami’s Guesthouse, built right on the cliffs and boasting amazing views of the rice terraces that Banaue is known for. Made an UNESCO Heritage Site in 1995, there are 2 main clusters of of rice terraces. One in Bagaan, where we were, and one in Batad. The sun set pretty much after we showered but you could feel the difference the environment here was from Manila. Dry, cool air that felt much cleaner to breath was a good reminder of home. 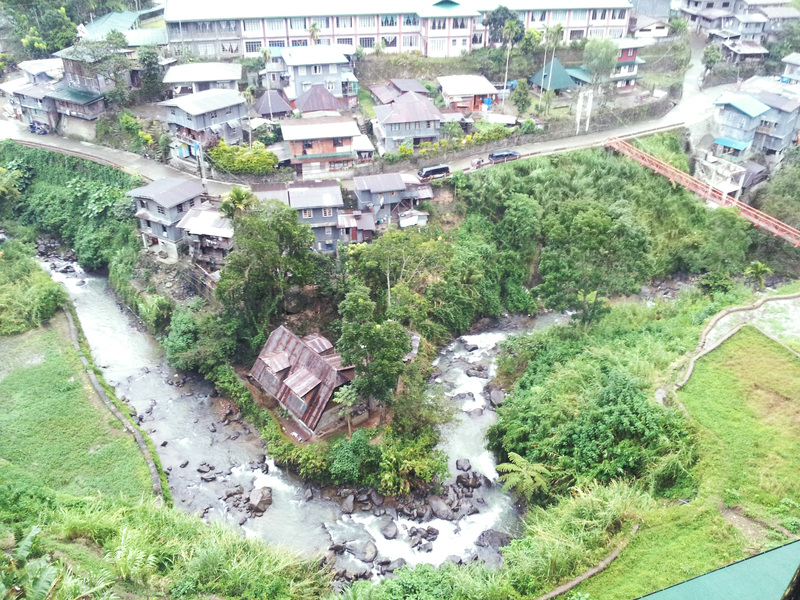 View of the town from our guesthouse. Not too shabby! One of the few street lights in town. You might not be able to tell but this is a steep incline. Just walking around got me winded! The food at the guesthouse was modest. Usually a portion of protein and a small mound of rice on the side. The highlight was the San Miguel beer that cost under $2CAD. 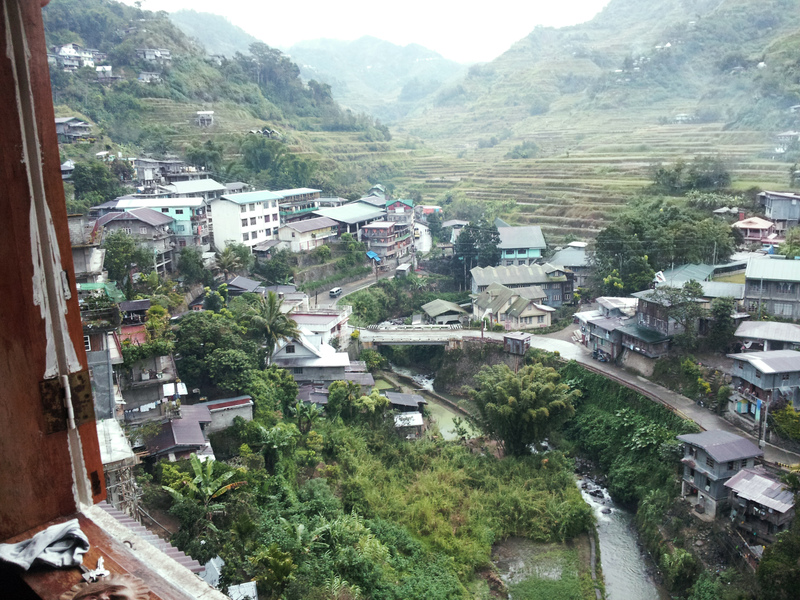 We wanted to explore more but Banaue is a small town with few street lights so we couldn’t see much of anything anyways. Tomorrow was going to be a long day of hiking, which worked for us since the brutal transit pretty much knocked us out at 8pm! 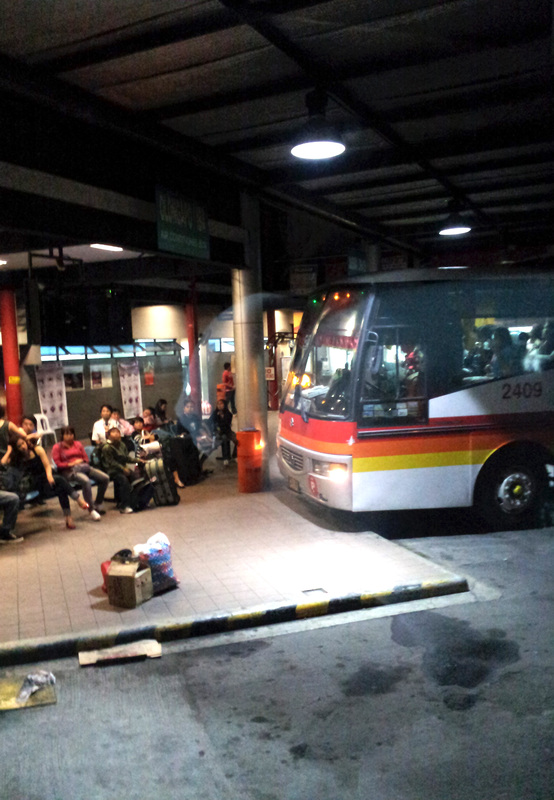 Many SE Asian countries integrate charter buses into their public transit system, mostly because most people can’t afford to fly to their village or their hometown doesn’t have an airport. Check the bus schedule if there is one available, or show up at the bus terminal and ask the office which bus to take to get to where you want to go. Ask your hostel, they are a great resource. The transit i described above is definitely brutal. I don’t recommend it at all. We did it because we were on a short time limit so we had to get there the hard way. If you have the time, check out Ohayami, which does direct trip non-stop to Banaue and back. Only one bus a day though. If you do end up making the arduous journey by public bus, tell them (repeatedly after 7 hours in case they forget) you want to get off at the Bagabag junction. 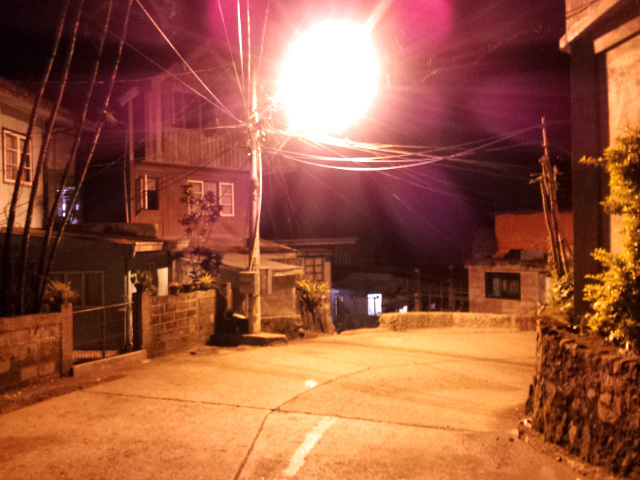 Once there, look for a group of jeepneys (usually red) and ask for one that goes to Sagada (about 1 hour). Once in Sagada, ask around for a jeepney to Banaue (around 1 hour as well). The Bagaan rice terraces are a larger series of terraces with a number of viewpoints that can be accessed with a local tuktuk. The drivers hang around the main transportation hub but your hostel can arrange for a pickup. The viewpoints should take an hour or 2. The view is quite stunning. The most green you’ll see for a while. When traveling in SEA, beer is king. Its bottled and they open it for you in front of you or you open it yourself. There is low risk of contamination and thus getting sick. If you do order a drink with ice, make sure the ice is made with an ice machine (usually they’ll be uniformly shaped and may have a hole in the middle), which usually filters the water before freezing.